Recipe for Chile Cheese Soup. This soup is perfect at the end of summer when the tomatoes and corn are at their best. 1. Puree the tomatoes through a food mill or in a blender and reserve. 2. Heat the oil in a soup pot over medium heat. Add the butter and melt it. Add the onion and garlic and sauté, stirring occasionally, until the onion is tender and translucent, 8 to 10 minutes. Add the corn and sauté until heated through, 5 to 6 minutes. 3. Add the Pureed tomatoes and simmer for 5 minutes. Season to taste with salt and pepper. Add the broth and continue to simmer until the corn is tender and the soup is flavorful, 10 to 12 minutes. Add the roasted poblano strips and simmer until they flavor the soup, 5 minutes. Add the milk and cream and simmer until heated through, about 5 minutes. 4. Remove the soup from the heat. Divide the cheese equally between 6 warmed soup bowls. 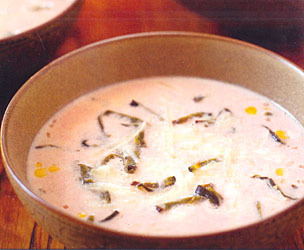 Ladle the hot soup over the cheese and serve it at once.